SpartanNash is committed to giving back to the communities where we live and work. Whether donating millions of pounds of food each year to fight hunger, sponsoring more than 3,000 community events and programs, volunteering more than 40,000 hours to help community nonprofits, creating more than 100,000 hours of workforce development training through our recycling efforts or using our resources and voice to raise awareness for vital needs, SpartanNash is committed to building local relationships and making a difference through our commitment to corporate responsibility. Our Direct Your Dollars™ program is one of many ways in which we partner with our retail communities to help our neighbors. The program is built on the concept of shopping with purpose – meaning, our store guests can use their purchasing power to support their favorite nonprofits. Through our Direct Your Dollars program, eligible nonprofit organizations can earn $1,000, simply by collecting $150,000 in eligible receipts from any of the more than 155 SpartanNash-owned retail stores or fuel centers in eight states. Earning money through the Direct Your Dollars Program is easy. Using the submission form and original receipts, the local store director will verify that $150,000 has been collected and a check for $1,000 will be awarded to the local organization. The best part? 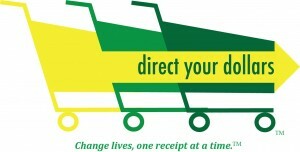 The more receipts an organization collects, the more often it can earn a $1,000 check! What are some ideas to help me promote the Direct Your Dollars program? Running a successful Direct Your Dollars campaign is easier than you think! Here are just a few ideas of how to promote your organization’s participation – and earn additional $1,000 checks in the process. Recruit a program coordinator to be the designated point of contact to coordinate receipt collection, tallying and promotion of the program. Challenge other classrooms to see who can collect the most receipts in a semester. Award the class or grade that collects the most receipts with a pizza party at the end of the school year. Put an announcement in the school paper. Use original receipts as an admission ticket to a school dance, sporting event or drama club production. Use the “Take Home Letter” to spread the word to parents and legal guardians – or send the letter electronically in the school e-newsletter. Share the program on Facebook, Twitter and Instagram. Tie the program to a specific goal. For example, let your supporters know the $1,000 will be used for a field trip, musical set, band production, playground equipment or other special purchase. Keep a running total displayed at your school’s entrance. Place an announcement in your bulletin or send out an e-news blast. Write an article for your next newsletter about what the $1,000 will support. Host an event like a bake sale or fundraising dinner and purchase your supplies at a participating SpartanNash store – then turn in the receipt and ask others to do so as well. Keep a running total at the entrance of your building. Share it on Facebook, Twitter and Instagram. Do you have logos or any other promotional items I can use? We sure do! Our online toolkit includes Direct Your Dollars logos, posters, sample social media posts and more — all of which can be downloaded and used to help promote your organization’s involvement in the program. Place the logo on a box or large envelope to collect original receipts, put the poster up in the entrance to your building, write an article for your upcoming newsletter or share your Direct Your Dollars goals on Facebook. You can also use our sample “Take Home Letter” to let your community partners know you’re collecting receipts for Direct Your Dollars. I’ve collected $150,000 in receipts. What do I do now? Make an appointment with your local SpartanNash store director. Bring the submission form, the IRS determination letter or affirmation letter and a copy of your W-9, along with all original receipts banded together in 15 $10,000 increments and the completed receipt tally form that documents each $10,000 bundle. Your store director will verify your receipt totals, sign the submission form and request your $1,000 check. Once it’s processed, the store director will call you to arrange a check presentation ceremony at the store.